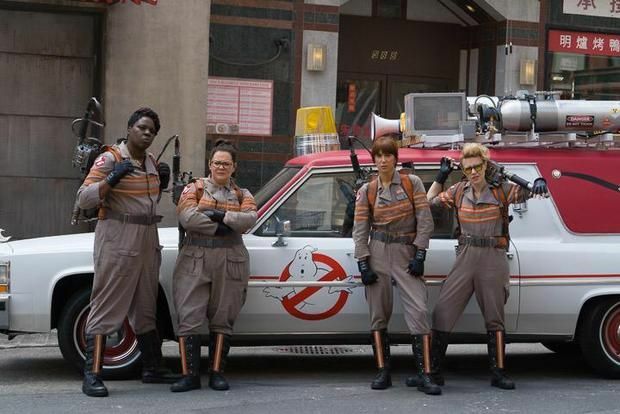 First Official Look At The New Ghostbusters In Full Costume Within! The upcoming GHOSTBUSTERS film has really been building up the wonder for fans as of late. The Paul Feig directed project has had it's fair share of rumors and what if's for a very long time, from the Sony email hack suggesting many stars which were interested in taking part to Dan Aykroyd still claiming that one day we will get an original sequel. With shooting rolling on strong, Feig has reveiled the very first official image the the all female Ghostbusters in full uniform along with the new Ecto-1. GHOSTBUSTERS will star Melissa McCarthy, Kristen Wiig, Kate McKinnon, Leslie Jones, Chris Hemsworth, Neil Casey, Andy Garcia, Michael Kenneth Williams and Matt Walsh. Feig directs from a screenplay which he co-wrote with Katie Dippold. The site went on to report that we can expect one familiar face in the form of the Slimer ghost character. It will be interesting to see how that plays out. Cameo appearances from Dan Aykroyd and Bill Murray are still up in the air at this point.